Wedding photography restrictions, speak to your officiant! Wedding Photography Restrictions and Documentary Wedding Photography. Documentary photography relies on a minimal set of wedding photography restrictions from the officiant if we’re to obtain the best possible storytelling coverage. What I want to get across to the readers of this article is how to communicate the approach of a ‘pure’ documentary wedding photographer (like myself) to your officiant. Hopefully, this will allow for the best possible results. To achieve those results, all parties involved in the wedding day need to be entirely on board with the documentary wedding photographer’s ethos and way of working. From the bride and groom, their friends and family and wedding vendors through to (most importantly) the officiant for the wedding ceremony. What if the officiant doesn’t allow photography of the most crucial part of the day or only certain parts of it? The final narration of the day will be akin to buying a jigsaw puzzle with a quarter to three-quarters of the pieces missing – incomplete. If you don’t know what a documentary wedding photographer is and how they work, I’ll give you a summary. Documentary wedding photography involves taking storytelling pictures without contrivance. It’s all about observing, anticipating and capturing real moments of emotive human interaction at weddings. Moments that can’t be set up. Moments that will evoke real memories in the future for those who were present. And for those who weren’t present, they’ll feel like they were there by viewing the narrative afterwards. These photographs will seamlessly tell a story of the wedding day when skilfully crafted into a narrative within an album or a slideshow. Don’t fall for the commonly used label of ‘documentary wedding photographer’ however. A lot of traditional, mainstream wedding photographers today have hijacked the ‘documentary’ label. They are using it as a marketing ploy, but on the day they’ll contrive moments. They’ll tell you what to do and they’ll be the centre of attention. 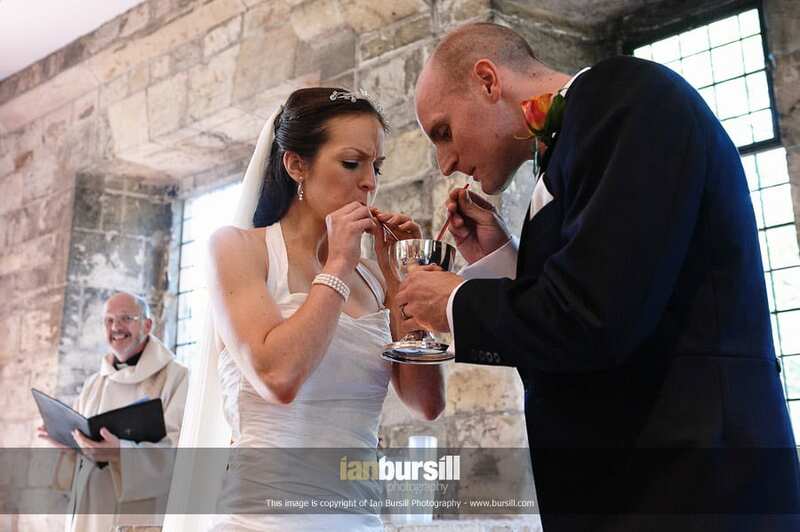 A pure documentary wedding photographer will never contrive moments! All of this is for an entirely different article another time though. Watch this space. Restrictions at my couples chosen ceremony venues are always a vital part of any pre-wedding discussions we’ll have. Some couples find out about restrictions during initial dealings with their chosen venue, but some are unaware. It’s not until I raise the subject with them at our initial meeting that they go away to find out if they can have their ceremony photographed without any restrictions. I’ve had mixed dealings with officiants over the years. I think the majority of my fellow professionals will agree with the following statements though. Catholic priests are mostly very relaxed about wedding photography restrictions. In some cases, they positively promote having the wedding photographer in close attendance during the ceremony. I can only recount one Catholic priest in all of my years of shooting weddings that threw up any barriers. C of E officiants are more of a mixed bag. Some are happy for the photographer to work without any wedding photography restrictions at all. If they are discreet, quiet, respectful of the ceremony and don’t use flash, it’s all fine. Other vicars will only allow photography from the back of the church. Some will only allow an image of the bride entering the church with her father. Then a staged picture of the signing of the register and the happy couple leaving the church. A tiny percentage will not allow any photography at all. I’ve yet to encounter this rare animal but do know of fellow photographers who have. They’ve sat outside the church all the way through the ceremony waiting for the happy couple (or the not-so-happy-because-we-have-no-photographic-record-of-our-once-in-a-lifetime-event-couple) to emerge. At this point, you probably think that it’s a no-brainer that all photographers work discreetly and respectfully, but, unfortunately, some don’t, and their antics can tarnish people’s perceptions of the wedding photographer. I can understand why some vicars are a little more strict regarding their rules if they’ve been unfortunate enough to have worked with an inconsiderate photographer. If you ever come to see me for a consultation, ask to see the video I have of one such plonker spoiling the wedding ceremony by acting unprofessionally and getting booted out by the vicar, but not before pushing him away! Asian weddings are usually a free-for-all with no wedding photography restrictions. I covered one such wedding in Leicester many years ago, it was my first Hindu wedding, and the priest interrupted the ceremony. He told me to take my shoes off and called me into the mandap to record the proceedings from closer in. They later had a formal civil ceremony after the very informal Hindu one to make it all legal. The stiff-upper-lipped registrar made it entirely clear – in no uncertain terms – that photography of the ceremony was only allowed during certain moments. The same day, the same couple, but two entirely different ways of working under two officiants. And then there are humanist weddings. Pretty much anything goes bar hanging from a tree upside down to get that high angle. I’ve also covered weddings in the same church but under different priests. The ‘regular’ vicar at one particular C of E church very local to me will only allow the photographer three shots. The processional, a faked register signing and the recessional. On one particular occasion at this church, the ‘regular’ vicar was unavailable, and his understudy was called upon to take the ceremony. As I hadn’t worked with the understudy before, I decided to go along to the rehearsal on the Thursday evening before the ceremony. I wanted to see if the church’s restrictions were set in stone or were different from priest-to-priest. I introduced myself with a smile and a firm handshake and cheesily mentioned that my middle name was ‘discreet’. It seemed to do the trick. I was allowed to have the full rein on the day as long as I shot from the rear of the church. There was no room behind the vicar as the choir stalls were filled entirely with a male voice choir. I also shot from multiple positions along the two outer aisles of the church. The coverage of their day was excellent, much better than any other wedding I’ve shot at that church before or since. Another wedding in Coventry presented me with another different scenario. My couple informed me that photography in the church on the day was okay. I explained to her that that wasn’t what my couple had told me, but she wouldn’t have it. We chatted with the vicar, and he backed his warden up saying that it was the same rules for all weddings and all photographers at their church. The ceremony itself was incredibly emotional, and I would have taken some beautiful images. The irony is that the cinematographer was allowed to sit quietly at the front of the church. Because his camera ‘didn’t make any noise’, he was able to record the whole ceremony. At least those wonderfully emotive moments were recorded for posterity. Meanwhile, I sat on the floor at the back of the church twiddling my thumbs, being watched closely by the churchwarden. If a church or venue sets these rules, then I’m not going to rock the boat by breaking those rules. It’s disrespectful to the place, and to the couple and their ceremony, even if it is a massive shame. To be fair to the church, they did let me shoot the signing of the register as it happened, without having to set up a ‘faked’ signing shot. This part of the day can also be another bugbear. Quite often, officiants will not allow photography of the ‘real’ signing of the register. I sometimes win them round by promising to shoot down low and from a decent distance back. The certificate isn’t visible, and some are fine with that. Others though are sticklers for rules and just won’t budge an inch. Rules even vary for civil ceremonies at venues and registry offices. Warwickshire registrars used to be well known throughout the wedding industry for only allowing photography during certain parts of the ceremony, but their rules are a little more relaxed nowadays. At the other end of the scale, I’ve covered weddings in North West Leicestershire, and the registrars are great. They’re adamant that I stand in the best position to get those shots of the bride coming down the aisle, the ceremony, and the first kiss. I even caught one registrar having a sneaky glass of red before the ceremony. I can only assume she needed it to calm her nerves! My one piece of advice to couples looking to have the full story of their day documented is to make sure that you speak with the officiant of your ceremony beforehand. If you’re using a ‘pure’ documentary wedding photographer, explain to your officiant how they will work. 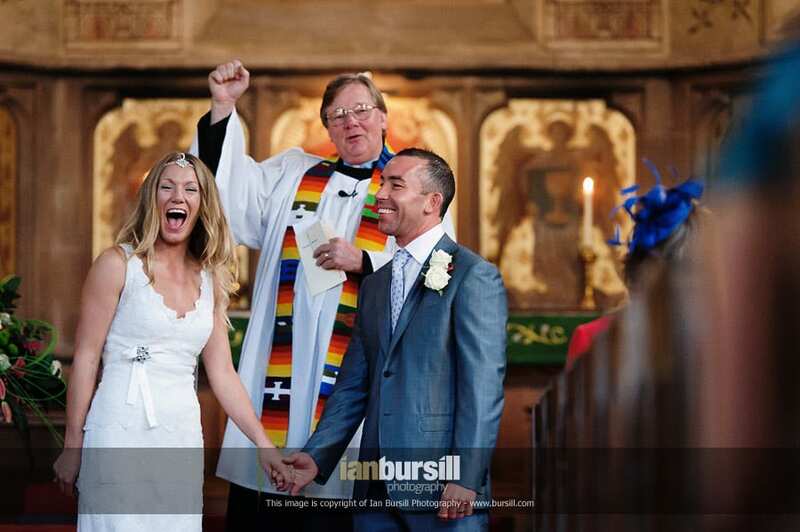 A ‘pure’ documentary wedding photographer will always be professional, courteous. They will have respect for the couple, their service and the ceremony venue. They’ll quietly document the service with the minimum of fuss and disruption. And they’ll be experts at shooting in low-light situations without having to resort to using flash. Once the ceremony is over, the officiant will have hardly known that the photographer was there. Who knows? It may just have restored their faith that not all photographers run around like headless chickens, machine-gunning their cameras and filling the venue with a flash every few seconds. There is another way you know!